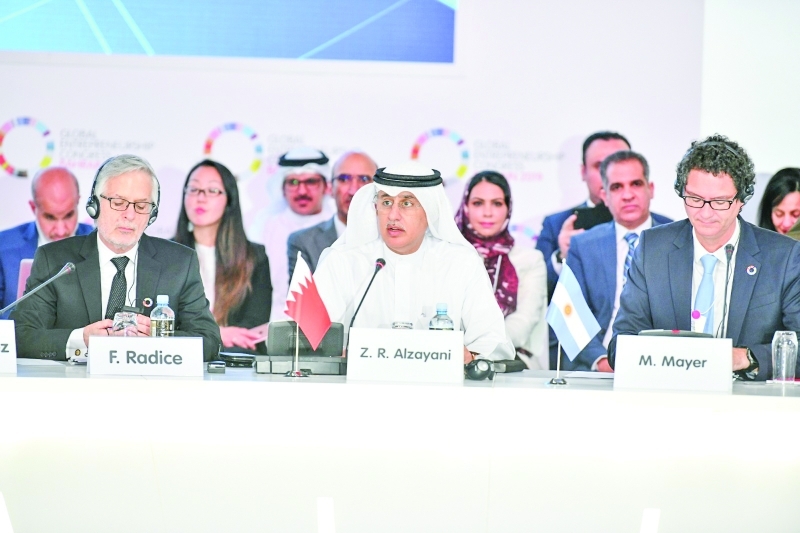 Minister of Industry, Commerce and Tourism, Zayed Al Zayani, delivered the opening speech at the Ministerial Meeting of Countries of Emerging Institutions, which was held on the sidelines of the World Entrepreneurship Congress yesterday. The event was organized by the Global Entrepreneurship Network (GEN) and the World Bank Group. The minister welcomed all 48 delegations attending the World Entrepreneurship Congress. He reviewed Bahrain’s government diligent endeavor to support the emerging, small and medium enterprises sector that has witnessed a significant increase in contribution to Gross Domestic Product (GDP). He thanked the initiatives adopted by the government, led by HRH the Prime Minister Prince Khalifa bin Salman Al Khalifa and the support of HRH Prince Salman bin Hamad Al Khalifa, the Crown Prince, Deputy Supreme Commander, and First Deputy Prime Minister, to develop this vital sector. The minister touched on Bahrain’s experience in supporting emerging institutions by the formation of the Small and Medium Enterprises Development Council, in addition to the adoption of a strategic plan aimed at raising the contribution to GDP, increasing exports and creating new employment opportunities. He noted Bahrain’s eagerness to be a center of emerging projects through the constant development of legislation and laws on providing a stimulating investment environment. Separately, Mr. Al Zayani met Polish Undersecretary of State in the Ministry of Enterprise and Technology Tadeusz Koscinski.